CPLO, the Catholic Institute of Education, and the Council for Religious Rights and Freedoms hosted a roundtable discussion on religious freedom in schools. The main purpose of the roundtable was to provide an opportunity to discuss the various religions in South Africa and how they related to education. Delegates were also asked to consider questions like: has your community had a long tradition of single perspective religious education; has your religious communities’ education had to deal with requests for exemption from religious observances (including prayers, uniform symbols, or other expressions of religious belief – how were such request handled? The questions were meant as prompters to get delegates to discuss the experiences in their own schools/communities. 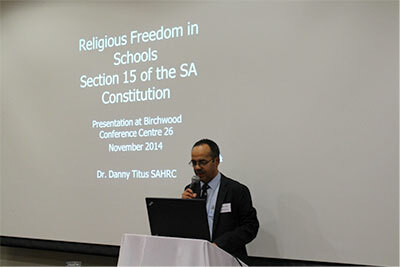 The speakers covered a wide range of topics – from the Constitutional rights to teach religious education, to the more theoretical/philosophical questions on the difference between religious education, religion instruction & religious observance – and how the legislative environment responded to these differences.